Clever Bulletin: As rebels behead Assad's thugs (in front of children) the awful pictures that pose many question? 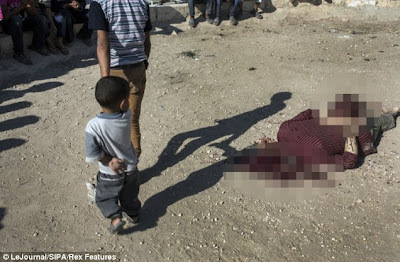 As rebels behead Assad's thugs (in front of children) the awful pictures that pose many question? The sword rests briefly on his neck as a blindfolded man kneels under a clear blue sky. Moments later, the executioner raises his right arm, slashes downwards and the prisoner is dead. The whole barbaric episode is watched by a crowd of jeering men, many of them armed. And sitting on a low wall only a few feet from where the wretched captive died so violently is a line of young boys. They were still there as the dead man’s head was dumped on his body. Another child, even younger, was led by the hand past the corpse. The public execution was the last of four that took place on August 31 in the town of Keferghan in the north of the country. The picture forms part of a set taken by a photojournalist - whose identity has not been revealed in order to protect him - who was given unprecedented access to the gruesome proceedings. Among the other photos are an executioner lining up his sword before delivering the final blow as his victim kneels in the village square - and a victim's head being held aloft by a jubilant fighter. Although it is difficult to confirm the political affiliation of those involved, an eyewitness told Time that the executioners belonged to ISIS - an Al-Qaeda faction opposed to President Bashar Assad's regime. The captives, meanwhile, are understood to belong to the fearsome Shabiha ('ghosts') - thugs loyal to Assad who are said to roam the country massacring women and children. The dreadful pictures emerged as the organisation Human Rights Watch released a video and report into brutal summary executions carried out by the other side - Syrian government forces. They massacred at least 248 innocent people in the towns of al-Bayda and Baniyas in May this year, the report said. The executions - which included at least 37 women and children - came after military clashes had ended and opposition fighters had retreated. People were rounded up and shot at close range in an apparent attempt to ‘teach a lesson’ to the townsfolk not to side with the rebels. The United States and Russia undertook a second day of talks in Geneva yesterday to try and achieve a diplomatic solution to the brutal conflict and get Syria to hand over its chemical weapons.